I loved The New Asics Kanmei training shoe. I walk many miles a week and love trying out new shoes, I change them about every 5 months, but have never used a pair of Asics. When WSR asked me to try them out I was very pleased to do so. I was a little worried as they didn't look that strong and robust but I gave them a go. I wore them around for a few days before taking them out on the road. On my first trip out I did 3 miles in them and they felt great, I had no sores, blisters or unpleasantness. Casual dress has never been so slick. 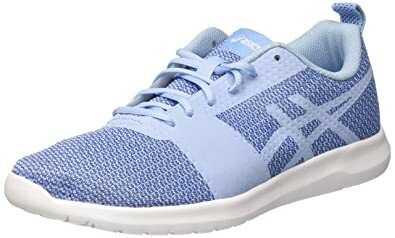 ASICS Kanmei adds a comfortable fit and feel to your everyday look by contouring to your feet and bringing on the sleek with a smooth upper design. Seamless knitted upper encases each foot in durable comfort. The no-sew construction features for an irritation-free fit, because we know how rubbing and blisters can ruin your day. Synthetic overlays wrap the midfoot for increased stability; reducing in-shoe slippage for a smooth, distraction-free ride. Injected EVA resides in the midsole to supply lightweight flexibility and underfoot cushioning; sparing your joints as you strike down onto hard, unforgiving surfaces. Multi-directional flex grooves complete the Kanmei, adorning the outsole to support the wearer's natural range of motion; for even, uninterrupted strides. The pull-tab features for easy on-and-off.